The trouble with history is that it’s retrospective. Everything makes sense and can be justified or condemned from the comfort of your 21st century living room. When writing about external events, objectivity comes naturally. The more difficult task by far is that of autobiography. Nevertheless, writer Peter Goldsworthy attempts this in his deadpan but very funny account of the first 20 years of his life, His Stupid Boyhood. Goldsworthy is a prizewinning Australian poet, playwright, novelist and now librettist – his opera “Ringtone Cycle”, a delightfully-named cabaret quintet for singer, piano trio, and iPhone (sic), composed with Graeme Koehne, will be produced by Opera Australia this year. 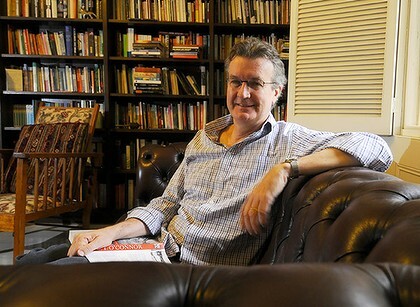 Goldsworthy is also a doctor, and divided his time between writing and general practice. He’s been hailed as the “Australian Chekov”, (a sobriquet which should surely be awarded to playwright and doctor Ron Elisha, who was prominent during the 1970s and 1980s). I’ve often wondered about this curious link between medicine and writing. There seems to be a mystic line that links some healers and artists. Think of neurologist turned author Oliver Sacks, British poet and GP Dannie Abse – or, indeed other luminaries such as John Keats, Arthur Conan Doyle, William Carlos Williams, AJ Cronin, W Somerset Maugham and Mikhail Bulgakov who were all medically trained. If science transits pleasingly into poetry, Goldsworthy’s special gift is his ability to make the prosaic poetic, to take the seemingly mundane events of everyday life and give them a novel spin. Goldsworthy takes us into the suburban life of his childhood in South Australia. His father was an itinerant teacher and so the family moved frequently from place to place. Maybe it was this sense of impermanence that spurred Goldsworthy on to putting things down permanently onto paper. We witness his first years at school, his friendships and battles, his first love – the sound of car engines being cranked into life – his forays into multi-culturalism as he surveys the strange and wonderful meals his Dutch and Italian classmates bring in their lunchboxes. We see his early romantic crushes, the embarrassing fumbles with girls in the cinema, his disenchantment with his own lanky body as he grows taller and thinner in adolescence. He is both intellectually curious, and entrepreneurial: his first book sales were hand-written instructions for his used, cast-off Chemistry sets which he sold to gullible classmates! Compare this later, successful mood poem to an earlier poem, Hollow Clocks, published by a young Goldsworthy in his University paper, Barbitos, in the 1970s. Goldsworthy Senior tears into this youthful effort, ravages it. He hasn’t a good word to say about it now: for him it’s pretentious, forced, derivative (compound words like stumblingbleedingaching had already been coined by James Joyce fifty years earlier.) And yet, Goldsworthy has captured the fury of many young intellectuals contemplating Australia’s involvement with the Vietnam War. There’s undeniable promise here, which Goldsworthy refuses to acknowledge. In fact, the most striking fact about His Stupid Boyhood is Goldsworthy’s complete self-deprecation. He doesn’t look kindly on his younger self. He dismisses himself as a dandy and a prig, self-obsessed, self-absorbed and completely lacking in self-awareness. Though Goldsworthy’s honesty is refreshing, you can’t help feeling he’s being unduly tough on himself. Many of us have gone through the same phase of being arrogant as teenagers, indulged in precious affectations and written very bad verse. The difference is Goldsworthy’s early verses were not only better than most and published but read to – and enjoyed – by none other than Allen Ginsberg who just happened to be visiting Australia at the time. Not bad for an 18-year old pipe-smoking medical student with a penchant for bilious coloured cravats! If Goldsworthy writes a further instalment of his memoirs, I’ll be happy to follow him through the next stage of his life. Hopefully, he’ll look kinder on himself by Volume 2. Read it: for superb poetry and almost total recall of an Australian suburban childhood in the Fifties and Sixties. Tags: 1950s, 1960s, 1970s, AJ Cronin, Allen Ginsberg, Anton Chekov, Arthur Conan Doyle, Barbitos, Graeme Koehne, His Stupid Boyhood, John Keats, Oliver Sacks, Opera Australia, Peter Goldsworthy, Ringtone Cycle, Ron Elisha, Vietnam War, W Somerset Maugham and Mikhail Bulgakov, William Carlos Williams | Permalink.